Seriously, this comic is just flat-out fun. 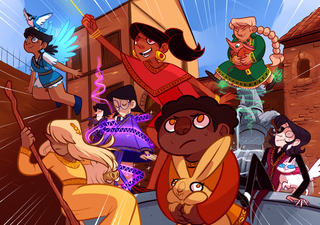 Robin has created a colorful cast of characters (including a few who are non-binary), who compete in a series of games to prove themselves the most competent magician. But there is one competitor who stands out: Lucy. Lucy is fashionable, suave, and seemingly confident, but they aren’t color coordinated like the other magicians and, more importantly, we’ve never seen them perform actual magic. Still Lucy manages to stay in the game through a combination of resourcefulness and luck, and with the help of their familiar, a cat named Ivy. So what’s the deal? Does Lucy really not have any magic, or do they harbor a more complicated secret? In the meantime, we get to watch Lucy and their rivals flirt and fight, battling each other and their own self-doubts. In this magical competition, we the readers are the real winners.